Jill Dennin has worked as the volunteer coordinator for Boyertown Senior High School. This part-time position was administered through a grant received through the pupil services department of the Boyertown Area School District. Jill was responsible for bringing together both staff and community volunteers to work with students at the high school on various school and community projects. In addition to this position, Jill is currently the president of the Boyertown Elementary Parent Teacher Organization (PTO). She is responsible for organizing all the PTO volunteers, recruiting speakers, coordinating events, running meetings, and overseeing a $15,000 a year budget. Prior to becoming a community volunteer, Jill worked as a fundraising coordinator for the Virginia Chapter of the Leukemia Society. She has a Bachelor of Arts degree in Public Policy and Political Science and started out as an administrative assistant to Governor of Connecticut, in his state-federal relations office in Washington, D.C.
Paul Stahl has owned and operated his own advertising and marketing business since 1978. He has a Bachelor of Arts degree in applied arts and prides himself on keeping a sharp eye out for the health of his clients’ “bottom line.” Paul’s clients include local and international businesses in assorted manufacturing and service-oriented venues. He is a member of the local Optimist Club, a charter member of Boyertown’s Raccoon Club, a volunteer for local political candidates, and community volunteer. Jane Stahl is enjoying her 34 th year of teaching English at Boyertown High School. During her tenure she has created and taught a variety of courses in literature, communications, and media; advised a school newspaper; coached Optimist Oratorical Contest participants; chartered a Spirit Club, Debate Club, and a TV Talk Show. She serves on assorted committees for the district, acts as a media liaison for the high school, and facilitates professional development teacher workshops. She has written hundreds of newspaper articles and assorted types of advertising copy for her husband’s advertising and marketing businesses and has appeared on local radio and television programs to highlight school and community events. Gretchen Lea is the Director of the TriCounty Area Chamber of Commerce Arts Council which is a non-profit organization with its headquarters in the TriCounty Chamber of Commerce office located in Pottstown, PA. She has earned an ASID in Interior Design and was the proprietor of an interior design firm for over 15 years. In 2001, she earned a Bachelor of Arts in human services. For five years she recruited senior citizens to do a wide variety of volunteer work for non-profit organizations located in Montgomery County. Her current board positions include Building a Better Boyertown, YWCA, Montgomery County Workforce Investment Board Youth Council, Preservation Pottstown, the Carousel of Pottstown, and Fellowship Farm. As a volunteer she ran summer daytime arts activities for youth, a teen coffeehouse, a holiday house tour, a garden tour and has won a variety of awards from the Philadelphia Horticultural Society for entries in their annual Harvest Show. She maintains membership in the Berks Art Alliance and the Pottstown Area Artist Guild. 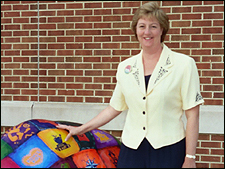 Paul Stahl's “Easy Button” is a coveted item in many instances; Mayor Marianne Deery considers its uses during Building a Better Boyertown's 2006 Coming Out of Hibernation Festival. “That was easy!” Paul Stahl shows off the source of his power to Mayor Marianne Deery during the second annual Coming Out of Hibernation Festival, Marcy, 2006. Paul Stahl listens attentively during Boyertown Times photographer Harold Hoch's conversation with artist Ineke van Wekhoven, a featured artist at Grace Pirog's Gracefully Framed Shop during the artists' walking tour of BBB's Coming Out of Hibernation Festival, March 2006. 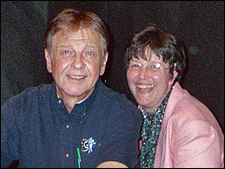 Momma and Poppa Bears, organizers of Bear Fever, Paul and Jane Stahl rest a minute on the stage of Boyertown High School’s old auditorium after the final 2005 Insight Show which showcased Bear Fever. 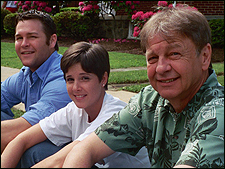 Poppa Bear Paul Stahl (rt) waits with son Jeff (lft) and Jess Hardin for the start of the Memorial Day Parade, May 2005. Memorial Day is the family’s favorite holiday. They look forward to chatting with folks in front of Jane’s mother’s home on West Philadelphia Avenue whom they don’t see from one year to the next. Judy Hunter, Bear Fever’s Shared Bears Coordinator, takes her place beside the Custom Construction Bear, a shared sponsorship constructed through her tireless efforts. 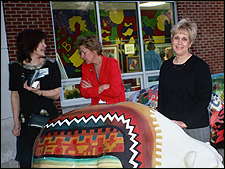 Judy’s bear, named White Bear by its artist Lesta Bertoia, features a mystical story behind his creation highlighting the theme and necessity of working together. Give us a smile! Passing the family teaching torch, Jane leaves Boyertown High School to her son Jeff effectively ending her 35-year teaching career at graduation with the Class of 2005--a “seamless transition” of Stahls. Jeff teaches Business and coordinates the gifted program at BASH. Smiley faces are their shared symbol—at home and in the classroom. 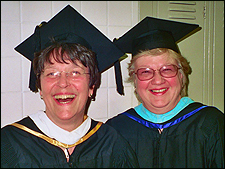 After 50+ years in school, Jane Stahl looks ecstatic with her good friend Susan LeClair at Jane’s final graduation from Boyertown High School. 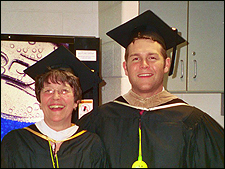 Jane graduated herself from BASH in 1965 and ended her 35-year teaching career there on June 8, 2005. 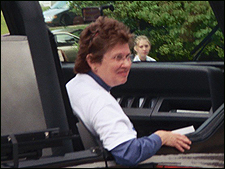 Bear Fever’s political “arm” Mayor Marianne Deery enjoys a ride to the Memorial Day ceremonies at Fairview Cemetery, May 2005 in a vintage automobile. Bear Fever’s coordinator Jill Dennin (left) chats with Christy Pierce who spent countless summer hours during the summer of 2004 making phone calls, visiting businesses around town…selling bears. Imagine: a 17-year-old completely dressed up in heels and hose on a summer morning at 8:00—ready to invite businesses to join the Bear Fever project. Bear Fever inspires miracles! Bear Fever’s coordinator Jill Dennin stands proudly beside her favorite bear “Patches,” sponsored by Boyertown Elementary School’s PTO.